Day 168 Their Stumbling block, our foundation stone. The picture is of the sky tonight. 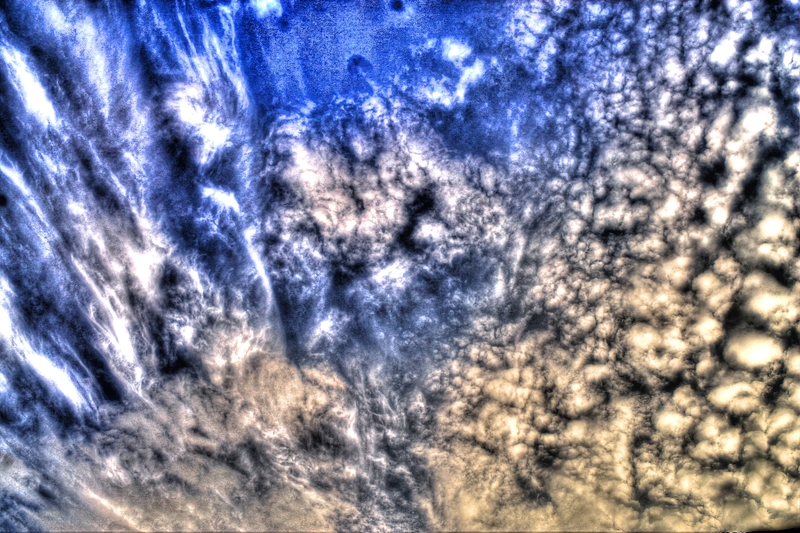 I have adjusted the contrast to bring out the shapes in the clouds. How fascinating as it reminded me of a battle going on. Rather grotesque shapes are at the bottom right and and the upper left seems to be a blue wave overcoming the darkness. There are religious wars going on in the Spirit world. The same is true down here on earth. There are people from the Islamic State and other places attacking Christians and others, torturing, beheading, crucifying, forcing them into slavery and perhaps worse. In contrasts there are Christians and others fighting back in the same way that Jesus did – by giving their bodies as a living sacrifice. 22 For Jews request a sign, and Greeks seek after wisdom; 23 but we preach Christ crucified, to the Jews a stumbling block and to the Greeks foolishness, 24 but to those who are called, both Jews and Greeks, Christ the power of God and the wisdom of God. I Woke up with a dream replaying all of my failures, knock-backs, all my times I didn’t get chosen. And there where many. If you have no failure in your life and everything you have done has turned to success and happiness then this blog is not for you. Perhaps you will experience failure one day? But to fail is not to be a failure. A simple analogy is that whilst learning the trumpet I had to go through many days of playing wrong notes. If I gave up very early I wouldn’t have the technique that I have now, I persevered through the mistakes. I got up after the knock backs and carried on. Constant reports of Christians dying. This is the work of the devil. His presence is seen by many across this earth and yet people just carry on with their lives and not admit that we need to act. Jacob thrown into the pit by his brothers. Has your life at times felt like Jacob? Constant knock backs from his brothers and eventually being thrown into a pit and left for dead by some and sold as a slave as an act of pity. I have had so many knock backs when applying for jobs that in the end I got rather nonchalant about the whole process. That was until I heard God speak to me through a lady one day. She seemed to suggest that I was needed in a school and so that was the one I applied for and got the job. It felt like coming home to a family, and so that is where I will stay until God directs me further. Peter denying Christ at Christ’s most painful moment on the cross. Peter must have felt terrible as everyone was looking for him to lead and he just stepped back and cowered from all the hate that was being thrown around. Sometimes I feel like cowering than carrying on, but prayer and communion with God always brings me back. Prayer is the most important thing we should do. But it seems to be the thing less devoted to in many churches, why? Not just services were we are going through set prayers, but actually sitting around and praying with each other, for each other. Again the authorities must have thought they had dealt with this renegade as they had him imprisoned, but again God turned this situation around through the Holy Spirit, through Paul. Let us encourage one another through our failures, mistakes and bad days so that we can strengthen each other in our faith. Let us pray for one another daily. Christ is a stumbling block to many, as many will look at his response to oppression and laugh. To gladly with joy accept a death in this world! But to Christians we are called to follow if we must but certainly respond in a loving manner, not a manner of hate. Lord God I pray tonight that you bring your presence down to whom ever needs your comfort. Help those who are giving the ultimate sacrifice and help to lift the eyes and ears of many so that Christ will not be a stumbling block, but they will see his truth and seek repentance. Help us all to be not a stumbling block to others faith but to be a foundation stone. Day 169 Little children, let no one deceive you.